Oh, my goodness. 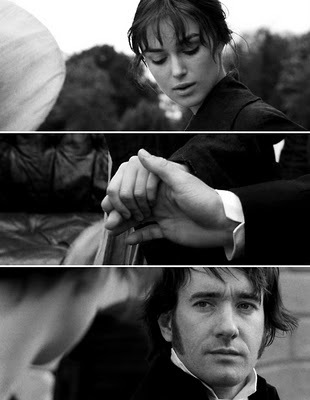 I finished reading Pride and Prejudice today for the first time, and I am in love. I've seen the 2005 movie several times, so I knew the general plot and ending, but I still could not put the book down! In the book, Wickham is more detestable, Jane more endearing, Elizabeth more relatable, Collins more ridiculous, Darcy more desirable, etc. The whole time I was reading, I was hoping Mr. Darcy would pop up again. Elizabeth's interactions with Darcy punctuated the whole book for me. My fave scene in the movie! Love when she sees him walking towards her in the field!